Once again, with Gen Con around the corner and the imminent release of Horror Adventures, I want to bring something scary to life! This time around it’s less about straight horror and more about paranoia. If you’ve ever thought you had seen something moving out of the corner of your eye or had the feeling you were being watched, then the shadow person is for you! This figure made of pure darkness rests between naturally occurring shadows, almost imperceptible to the eye. Speed 50 ft., fly 20 ft. Drain Motivation (Ex) The touch of a shadow person drains ambition from creatures, replinishing it in the shadow person. A creature struck by a shadow person’s incorporeal touch must succeed on a DC 16 Will save or become fatigued for one hour. If the creature is already fatigued, it becomes exhausted instead. The save DC is Charisma-based. Additionally, if a touched creature fails its Will save, some of the creatures ambition is transferred to the shadow person. 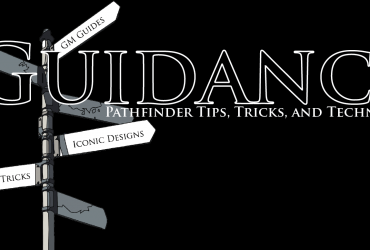 The shadow person gains 5 temporary hit points and a +1 bonus to attack rolls, damage rolls, saves, and skill checks. The bonus to rolls stacks up to a total equal to the shadow person’s Charisma bonus (minimum 0). Indiscernible Form (Ex) A shadow person is difficult to distinguish from its surroundings. A shadow person can use the Stealth skill even while being observed. As long as it is within 10 feet of an area of dim light, a shadow person can hide itself from view in the open without anything to actually hide behind. While hidden in this manner, a shadow person can use shadow walk as an immediate action. This shadowy form also grants the shadow person a deflection bonus to AC equal to its Charisma bonus. A shadow person is a ghost-like being tied to the Plane of Shadow. 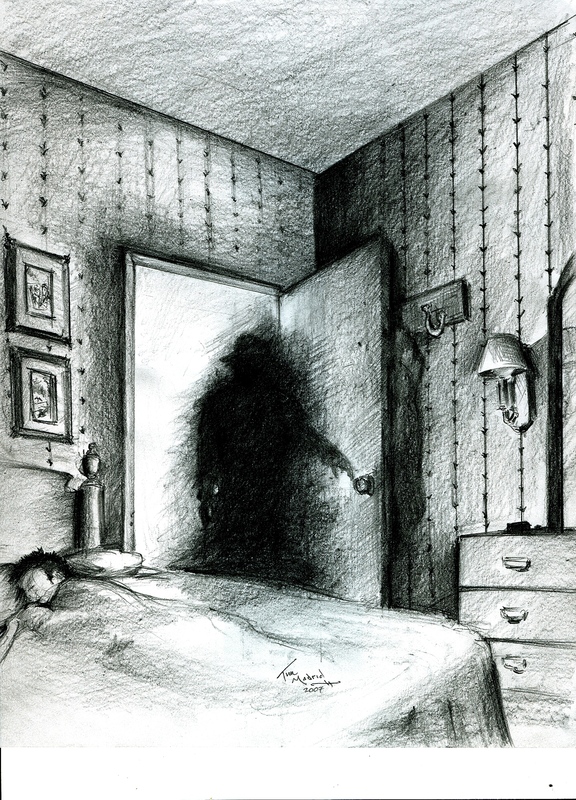 A shadow person is formed when a person dies after living an unfulfilled life. The person’s soul is unable to continue through the afterlife and finds itself stuck in the Plane of Shadow to watch the Material Plane from afar. After some time, the soul is infused with Shadow Energy, allowing it to move between the planes to search for purpose. Once on the Material Plane, a shadow person haunts those that appear to be living interesting or accomplished life in hopes of attaining fulfillment to move on in the afterlife. 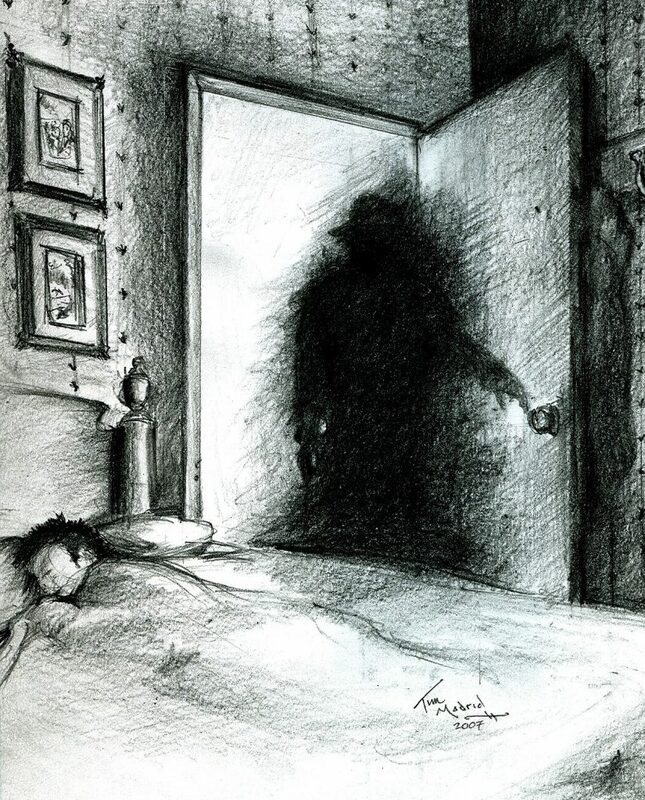 Shadow people appear to be humanoid in shape, but sometimes take on aspects of their former life. A shadow person will sometimes have the form of a hat or an important object in its hand. These objects represent aspects of the shadow person’s former life and are usually clues towards the ultimate fulfillment of the shadow person. Unlike the common shadow, shadow people are not generally malicious. Most shadow people seek to only watch from afar and glean enough experience to find an ultimate rest. However, some shadow people choose to steal the drive from others by force. The cult of an ancient god enacted an ancient ritual to awaken their patron. The ritual failed and the cultists soon became shadow people. Now the shadow people haunt the lands and the PCs must decide between completing the ritual to awaken the dormant god or allowing the shadow people to menace innocent people. A shadow person haunts the surrounding swamp lands. This shadow person has a large crown resting on its head. It is up to the PCs to work with the shadow person to not only learn its past, but also restore its long dead kingdom. The citizens of a small city find themselves slipping further into lethargy. A malicious shadow person is to blame, but its ability to return to the Plane of Shadow makes it difficult to capture the shadow person. The PCs must give chase before the entire city becomes a shadow itself. The shadow person is something that you may have seen before. On late nights with too little sleep, I know I’ve seen something moving just beyond my vision, only to turn and find a waving tree or a lifeless street lamp. The mind plays tricks and it easy to imagine that something was just there. I wondered what could be. I then stumbled on the concept of the shadow people. It seems I was not alone in seeing these figures. There seems to be no agreed upon aspects for the shadow people, save for their form. This gave me a blank slate for the motivations and abilities of a shadow person. Most people do not believe shadow people to be malevolent, so I decided that a (mostly) tragic being was suitable. Horror is filled with a lot of misunderstood creatures and the shadow people would rank well among them. I also wanted to recreate that feeling of seeing the shadow person for a split second and then have it be gone. To that end, I gave the shadow person the ability to shadow step almost instantly. Well, I hoped you liked this foray into the more horrifying side of things. Please let me know what you think. 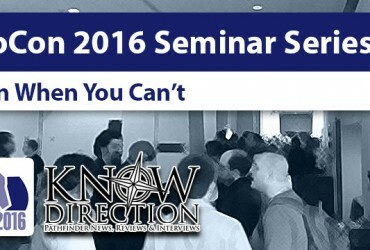 If you end up using a shadow person in your horror game or you have any request for a future Monstrous Physique, please drop me a line at KnowDirection@hotmail.com. Shadow person image created by Wikipedia user Timitzer and is licensed under Creative Commons. Very cool as always, Luis!